Teachers’ Contract Signed… just send us the bill… | Look Out Scarborough! Well, friends, it didn’t take long to get back into the swing of things after the summer doldrums. At their October 6 meeting, the School Board approved a new three-year deal with the teachers’ union. Remember, this contract probably accounts for 40% or more of total school expenses. We wish we could tell you how much the new contract is going to cost you, but we can’t. Frankly – and frighteningly — we’re not sure anyone really knows what the total cost of the new contract is. The cost information wasn’t disclosed at the meeting. If the Board members had it, they weren’t sharing it with the public. But we were promised that cost information will be developed by the Superintendent and presented at the next School Board meeting. 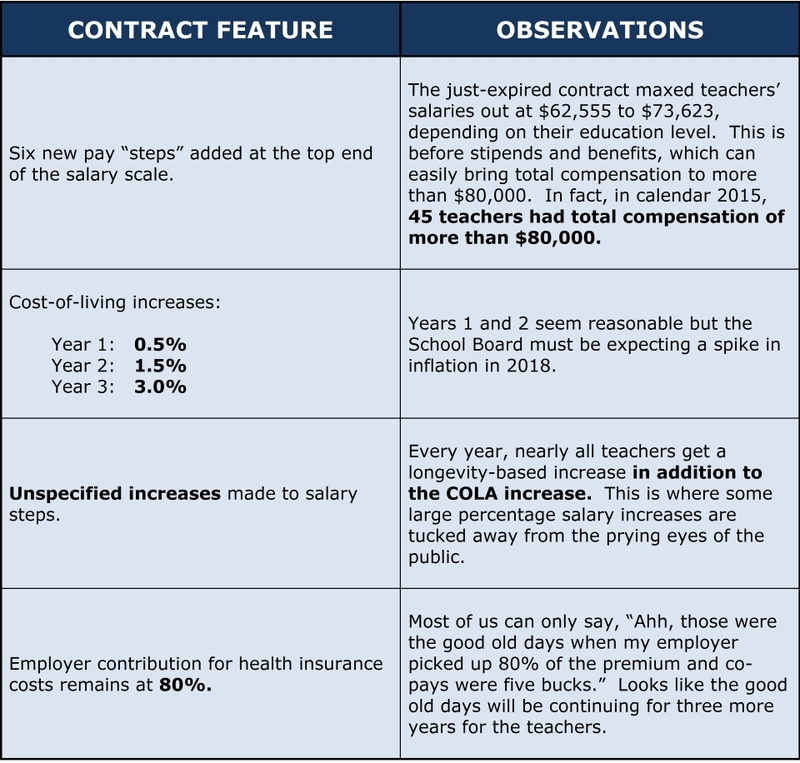 Wait, what… the cost of the contract is going to be developed and shared after the School Board unanimously approved it? That’s weird; in that old-fashioned world we live in, you find out how much something costs before you agree to buy it. Did we miss a paradigm shift? Again, no costs were mentioned for any of these items. Anyone want to hazard a guess as to the amount of increase these measures will mean for the “level services” budget over the next three years? Also announced at the October 6 School Board meeting were the preliminary financial results for fiscal year 2016, which ended on June 30. Turns out it was a good year financially… the schools ended the year with a surplus (or fund balance) of $1,960,000. Revenues were more or less as budgeted, but expenses were favorable by about $2.2 million. Usually the schools come in with a favorable expense budget variance in the $400,000 to $500,000 range, but this year it was significantly more. 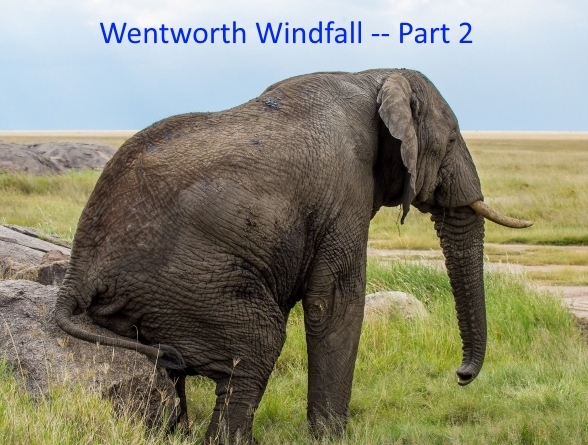 The main reason – our old friend the Wentworth Windfall! Will it ever go away? Bottom line… we taxpayers have already ponied up about $2 million of tax revenue which is available to pay for the coming year’s school budget. So when the Fiscal 2018 discussions start early next year, don’t forget we’ve already got $2 million in the pot. Perhaps taxpayer funding can be flat for Fiscal 2018 since we’ve already anted up $2 million with the Wentworth Windfall. Okay, we admit it. 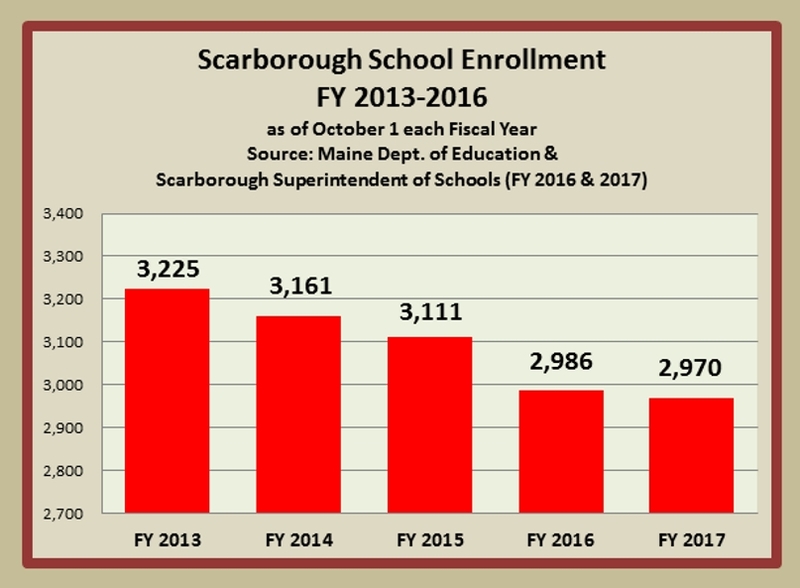 We felt a slight tingle of hopefulness when new superintendent Julie Kukenberger announced the October 1 enrollment numbers at the School Board meeting. It wasn’t the numbers themselves… it was just the fact that the superintendent was voluntarily informing the public about a key school department statistic. We hope this was a small inkling of transparencies yet to come. That would be a most welcome change. Here’s hoping that there will be periodic enrollment updates in the future. And that the new super will bring a new level of transparency to the school department. Following is an excerpt from current Scarborough High School lunch menu. Click here for the full month’s menu. Hey! Where’s the kale??? 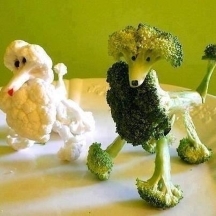 Must be in the Salad Bar. Faithful readers of this blog may recall that the budgeting of the school nutrition program has been a burr under your editor’s saddle for quite some time. The school lunch program routinely loses more than $200,000 each year. Yet every year school administration puts forth a budgeted loss of only $25,000 or so. Every year there is a new, hopeful story – never substantiated by realistic assumptions – of how the program is going to turn around financially. But it never does. The just-ended fiscal year was no different: You, dear taxpayer, were told in the budget that the school lunch program was going to require $25,000 of taxpayer funding. When the books were closed on the year, however, you ended up funding a loss of $237,000. We sincerely hope this charade will not continue and that the Fiscal 2018 school nutrition budget will provide an honest and realistic assessment of the program’s revenues and expenses. Now that would be refreshing. The two members whose terms are expiring are running – unopposed – for re-election. Nuf said. There are four candidates for the two seats that are up for grabs. For our money, Annalee Rosenblatt is a no-brainer for one seat. Annalee has lived in Scarborough for more than 30 years. Her record of public service to the Town during that period is unparalleled. She served two terms on the School Board, including one year as Board chair. In addition, she is a long-time member and past chair of the Kiwanis Club and served as the chair of the Scarborough 350 Committee in 2008. As a professional labor negotiator, Annalee has business skills which will be a significant asset to the Town, especially at budget time. She was one of the charter members of SMARTaxes (Scarborough Maine Advocates for Reasonable Taxes). Annalee is someone we can count on to represent ALL Scarborough taxpayers. Please take a look at Annalee’s website (click here), review her extensive qualifications and give her your vote. 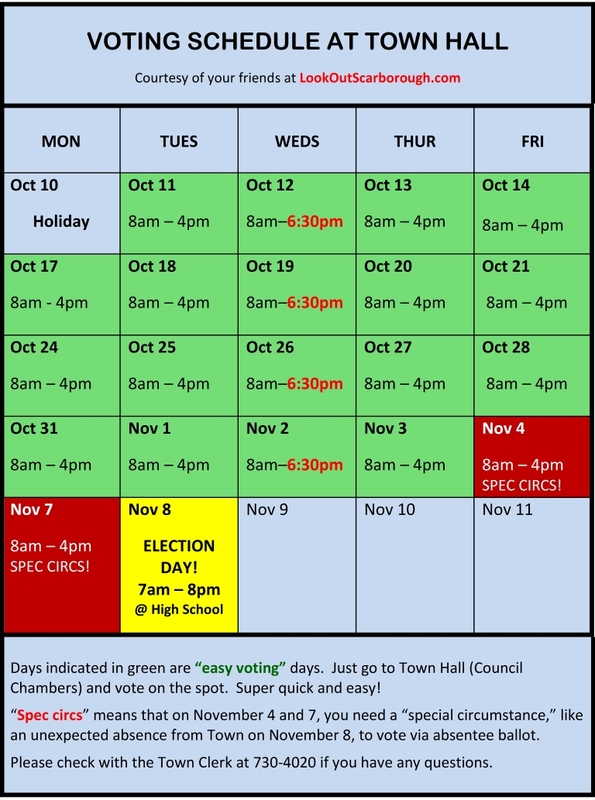 Vote today at Town Hall. It’s quick and easy! That’s all for now, folks. More excitement will surely follow. Breaking news as it happens. This entry was posted in Uncategorized on October 11, 2016 by Site Author. thank you TT for the up-date. always informative!! !